Wow, what a summer we had! We were able to partner up with many wonderful organizations, institutions, and events to spread the Golden Rule within their circles and attendees. I’m always charmed by the fact that our booth gets so much love by everyone. It’s always refreshing to think about how to be kind and then share it with others. We had different formats of doing outreach this year as we realized that each event had to be catered differently. This allowed us to explore more efficient ways on how our volunteers, staff, and resources were used. 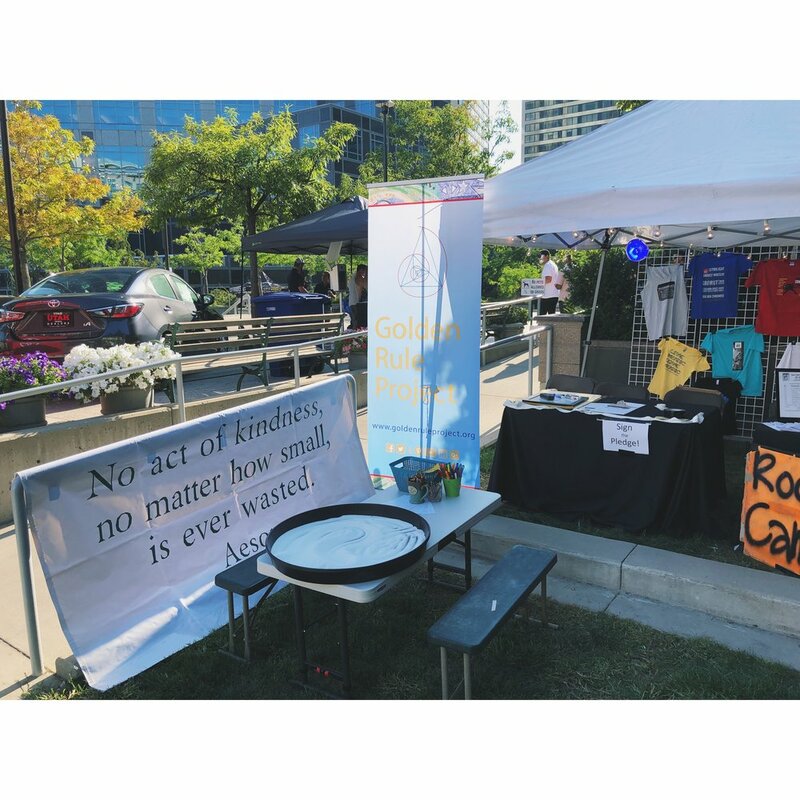 We want to thank the Rose Park Community Council for the opportunity to have a booth at Rose Park Community Festival, the Salt Lake Downtown Alliance for giving us a space at the Downtown Farmers Market, Lululemon City Creek for allowing us to be with them at State of Mind: Yoga at the Capitol events, the Utah Pride Center for the fun time at the Utah Pride Festival, the Salt Lake Arts Alliance for inviting us to have a weekly booth at SLC Twilight Concert Series, the Greater Avenues Community Council for giving us a spot at the Avenues Street Fair, and the East Liberty Community Council for trusting us with a great booth at the 9th & 9th Street Festival. people performed over 250 acts of kindness with our Kindness Chain activity! We had over 100 pledges to remember to live by the Golden Rule, Spread the Golden Rule to others, and to use the Golden Rule as a standard when practicing our civic duties electing our representatives. I love being able to hold a space for strangers to come in, think about kindness, put some energy to practice it, and then seeing how similar we all are when thinking on how to make our communities more loving and embracing peace. No matter the background, age, race, religion, etc. All answers tend to be sort of the same, because we are the same! Something that keeps popping up after every event. We may take on different identities in our daily lives, and/or we might have identities attached to our physical appearance at all times, but when we strip down to the essence, we all end up the same: A living human being with valid feelings and emotions, because we truly are one! Thank you to all who participated with us during this wonderful summer of kindness. If you would like to download any of the pictures, head to our facebook page and go to the End of Summer Outreach album. Tag yourself and your friends, and lets keep building the kindness momentum that we need so much in our communities during such a divisive time. Remember, we are the ones responsible to bring more kindness, consciousness, mindfulness, and peace in our communities.